ANNAPOLIS, Md., Nov. 17, 2018 /PRNewswire/ -- The U.S. Navy commissioned USS Sioux City (LCS 11) – the nation's sixth Freedom-variant Littoral Combat Ship (LCS) – at the United States Naval Academy today. 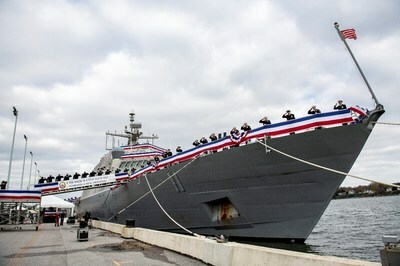 This milestone places the ship, built by Lockheed Martin (NYSE: LMT), into active service. It is flexible—with 40 percent of the hull easily reconfigurable, integrating capabilities like the Longbow Hellfire Missiles, 30mm guns, and manned and unmanned vehicles targeted to meet today's and tomorrow's missions. "We are confident that LCS 11 will be what the Navy needs, when the fleet needs it," said Joe DePietro, vice president, Small Combatants and Ship Systems, Lockheed Martin. "We remain focused on delivering these ships as quickly as possible with increasing capability and lethality. These ships will have a long lifespan, and we're working with the Navy to make LCS even stronger and more resilient." The Freedom-variant LCS integrates new technology and capability to affordably support current and future mission capability from deep water to the littorals. LCS 11 is equipped to support surface warfare. LCS continues to increase in capability. This year, LCS 5 and 7 completed Longbow Hellfire missile testing, LCS 9 completed RAM testing and LCS 5 and 9 participated in Fleet Weeks around the United States. There are seven ships in various stages of production and test at Fincantieri Marinette Marine, where the Freedom-variant LCS is built. The next Freedom-variant in the class is LCS 13, the future USS Wichita, slated for commissioning in Mayport, Florida, in January. LCS 19 is scheduled for christening on Dec. 15. "Two thousand men and women crafted this ship from flat steel to the capable and agile surface combatant being commissioned. The men and women who sail this ship have an enormous responsibility in protecting our nation and allies, and we consider it a privilege to support these missions," said Jan Allman, President and CEO of Fincantieri Marinette Marine. "I am confident that when called upon, the USS Sioux City will always prevail."